We’re gearing up for Carers Rights Day this Friday 25 November. 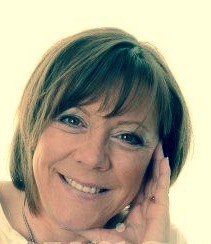 As the Department of Health and its sector partners seek to raise the profile and effectiveness of support for unpaid carers, we are delighted to welcome back Healthwatch Essex’s Yvette Wetton with this timely blog on the importance of carers assessments – and the value of listening. Yvette Wetton: "We believe in listening to people’s experiences of services and feeding back those ‘lived experiences’ to the people best placed to make changes." The Care Act 2014, which came into effect in April 2015, strengthened the rights and recognition of unpaid carers in the social care system. These unpaid carers play a vital role in our communities and Government wanted to recognise this fact by ensuring local councils provide the right support to them. This means that many more people have the right to a carer assessment today. These assessments are one way in which carers can be identified by local authorities so they can access the help they need in their caring role. However, when we asked carers about their experiences of receiving assessments, many were not aware of how to access them and some reported having to reach breaking point, or having to argue their case, before being offered one. At Healthwatch Essex, we believe in listening to people’s experiences of services and feeding back those ‘lived experiences’ to the people best placed to make the changes needed to improve matters. Engagement work with people living with neurological conditions and poor mental health. From our research, we know that NHS and social care arrangements for patient and service user feedback can often be fragmented between departments and organisations. This fragmentation hinders planning and militates against providing good experiences for patients, service users and their carers. Our project has kept carers and what they say very firmly at the centre of their support in Essex. We’ve spoken to hundreds of carers about their experiences and this has been used to review how Essex County Council undertakes carer assessments and is now being used to shape what support services in Essex will look like from next year. 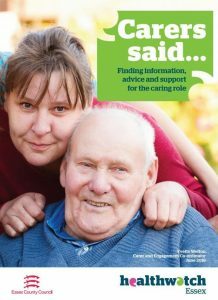 So when we asked carers about what would helpfully support them in their caring role, they didn’t necessarily talk about specialist carer centres or information services (although many described the help they get from these kinds of services as ‘lifesavers’), but instead many talked about the difficulties they experience in negotiating information sharing with professionals. We often heard examples of when services don’t work together meaning carers keep having to repeat their stories multiple times to multiple agencies. They described how health and care providers don’t communicate with one another, and that communications within organisations also seem to be lacking. This often led to a feeling that care was disjointed and carers left to deal with the consequences. Many we spoke to expressed anxiety and stress over having to chase follow-up appointments and referrals. They expressed a desire for systems to work better to support their care recipient, so that this, as a by-product, would support them in their caring role. They told us that they want services that wrap around the individual and their family, rather than having to deal with systems that simply don’t flex to meet people’s needs. So, by listening - really listening - to carers and telling the people who make the decisions about how services are organised and run, Healthwatch Essex hopes to bring meaningful input into how support is provided for carers in our county so they can be recognised, supported and appreciated for the vital role they play.